Decked out in blown up portraits of World War I veterans and acetates dating back to the early 1900s, the walls of recently opened Tattoo Box Traditional tell a story. Artist Kate Middleton, living in France and working out of Montreal, began construction at Tattoo Box Traditional in August of last year. 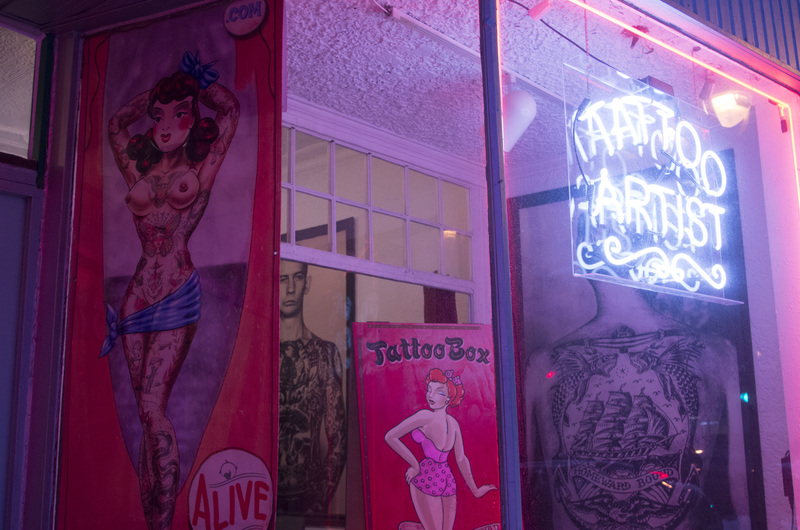 Originally meant to combat construction planned on Pine Ave. W., where her primary shop is located, she’s now hoping for the new location to double as a tattoo museum. Artist Liam Lavoie tattoos his colleague on a quiet day at Tattoo Box Traditional. Photo by Victoria Lewin. Middleton holds up the sketchbook of renowned artist Zeke Owens, who tattooed service men and women during and pre-war. Photo by Victoria Lewin. While residing in Avignon, France, Middleton also runs Livre and Let Die Books and Art Supplies on Pine Ave. E., as well as a small media studio out of California, her hometown. Ensuring the shop promotes a safe and open space for staff and clientele is one of Middleton’s top priorities. Being a female and lesbian tattoo artist, she said “misogyny is the biggest hurdle I’ve ever had to overcome, in myself and facing it from others. That needs to be ended before anyone or any gay woman can progress in their life.” Though the essence of Middleton’s vision is to showcase tattoo history, artwork that is traditionally misogynistic, racist, and otherwise offensive won’t make the cut in this tattoo museum. An acetate from the early 1900s by famous American tattoo artist Paul Rogers. Photo by Victoria Lewin. As a lesbian woman, Middleton works hard to ensure the shop maintains an open, safe space for all LGBTQ+ individuals. Photo by Victoria Lewin. Artists work on various projects during the snowstorm in Montreal on Feb. 13. Photo by Victoria Lewin. The shop offers free breast cancer ribbon and semicolon tattoos, symbolizing depression. Photo by Victoria Lewin. Shop decor includes walls of art from various artists Middleton has met and worked with over the years. Photo by Victoria Lewin. Tattoo Box Traditional is located at 1757 Amherst St. More information can be found on their website: tattooboxmontreal.com.